I know it’s been a bit but I finally got done with the first installment in my series of articles about online SCUBA communities! 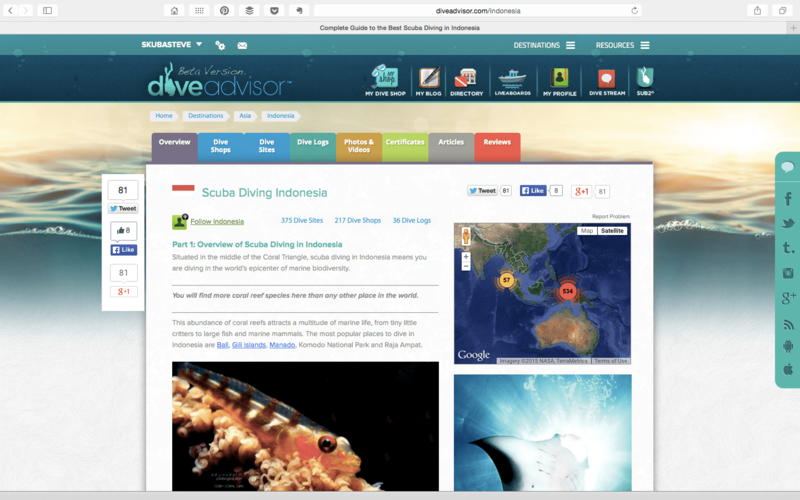 Say hello to Diveadvisor.com and the Diveadvisor mobile application. Many of the same features are available on the Diveadvisor mobile app as well. I think the video will give you a better idea of what Diveadvisor.com and the Diveadvisor mobile app than I can describe so dive on into the video and explore Diveadvisor for yourself. Once you’ve created an account – hook up with me (skubasteve) and let’s talk diving! Editor’s Note: Timur let me know today that there was an update between when I recorded my video and today – in the destinations section of the site tabs have been added for easier navigation (see below) – nice!